Need for Speed Payback hasn’t generated a lot of excitement since launching last month, but EA and Ghost Games are hoping the game’s first big update will provide it a nice pre-Christmas boost. The Speedcross update adds a new class of races, as well as a variety of other additions. Speedcross races are point-based competitions, where jumps, speed, fancy drifting, and destruction matter as much as coming in first. In addition to Speedcross, Ghost Games is promising new cars, steering wheel support, and multiplayer Drift Run competitions. The Speedcross races are paid DLC (unless you bought the Deluxe Edition), while the new cars, wheel support, and multiplayer additions are free. Check out a trailer and official rundown of everything coming to Need for Speed Payback, below. Take control of Mac as you go up against a number of drivers from all over the world, with cities such as Palmont, Bayview, Rockport, Fairhaven and Olympic City all represented, with the ultimate goal of beating the reigning champion, The Barracuda. Speedcross is an event that focuses on scoring as many points as you can through a pre-determined course. Go big, and go fast as you score points in each of the following areas; Drift Zones, Jumps, Speedtraps and Smackables. Speedcross will include sixteen brand new events, split across four zones — Canyon, Airfield, Construction and Ember valley. 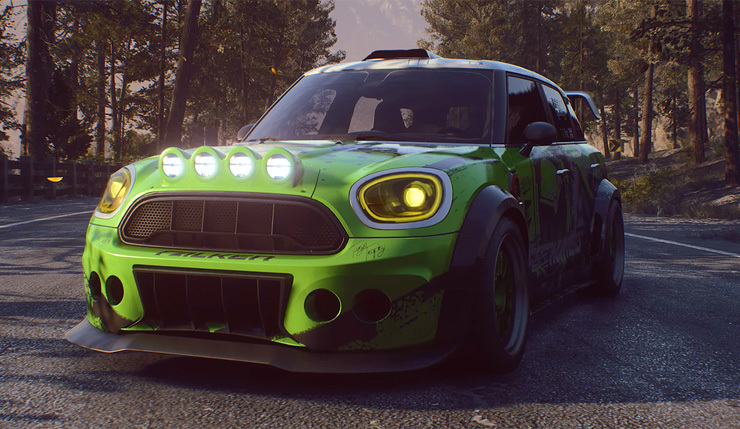 Two new cars will be added within the Speedcross pack, the Mini John Cooper Works Countryman and the Infiniti Q60 S.
You may have noticed a few cars being driven around Fortune Valley by the Street Leagues that aren’t yet available to own yourself. That all changes now. Abandoned cars will soon start to appear, hidden within Fortune Valley. Find the car, escape the cops, keep the car. Need for Speed Payback is home to a number of beautiful cars and rumor has it several of them are starting to appear throughout the world, just waiting for a new owner to come along. We’re talking about the Mazda RX-7 Spirit R, Volvo 242DL, Volvo Amazon P130, Plymouth Barracuda, Nissan Skyline 2000 GTR and the BMW M3 Evolution II E30. We’re adding a new game mode into Speedlists, Drift Runs. These are based on the Drift Trial events that you will have played within the single player of NFS Payback. Up to 8 players will be able to take part in the event, with a multiplier being given to those that are in front (distance wise). Since we revealed NFS Payback there’s been one question that’s been rumbling on amongst our community, will Need for Speed Payback support steering wheels? The short answer to this is that yes, steering wheel support is on the way. We’ve partnered with Logitech to ensure the Logitech G29 and Logitech G920 will be supported. Need for Speed Payback is currently available on PC, Xbox One, and PS4. The Speedrun update, and accompanying free add-ons, will be available tomorrow (December 19).